TUKWILA, Wash. (KCPQ)-- It's been said, every dog has its day. That's true for one lucky dog -- out of the pound and on the Tukwila police force. "He was in a shelter and he was about to be put down because of high energy, just a handful essentially, and the shelter called a trainer and said we have this dog, I think he might be good for you guys," Tukwila police officer Victor Masters said Wednesday. That turned out to be Apollo's second chance. 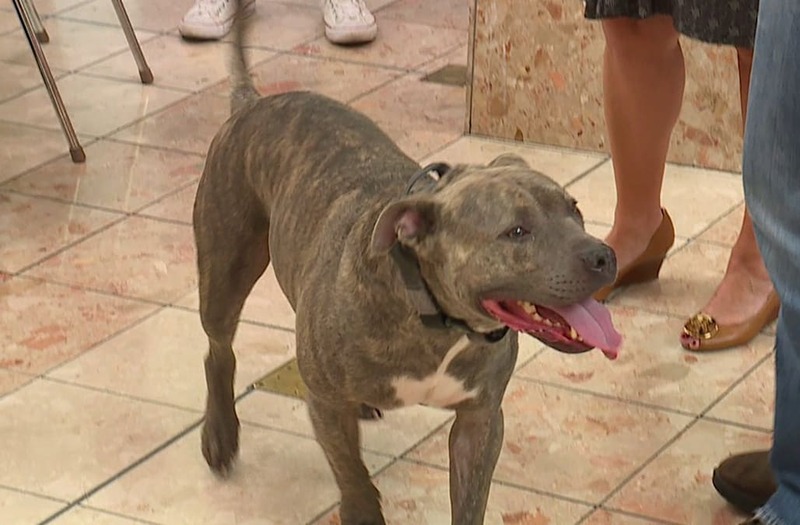 Apollo the pit bull was at a shelter in Washington, about to be put down, when a trainer realized he had what it takes to become a K-9 officer. Now, he is a drug-sniffing dog on the Tukwila police force. After running him through some drills, trainers realized he had what it takes to become a K-9 officer. And over the course of a year, Apollo caught the eye of several police departments. But because he's a pit bull, many were hesitant to take a chance on him. "Normally a German shepherd is the standard go-to dog. They are bred to be police dogs; pit bulls, not so much. They get the bad rap and people just want to avoid them," Masters said. The Tukwila Police Department just happened to be looking for a narcotics K-9 and Apollo did finish top in his class. "Chief said, 'You know what, we only hire the best officers; let's hire the best K-9.' And she said this K-9 is the best canine I have, he will finish top in the class," Masters said. On Wednesday, Apollo made his first public appearance during "Coffee with a Cop" in Southcenter Mall. From orphan to an officer, K-9 Apollo didn't just "get his day." He got his second chance at life. "He's not an attack dog. He's not a patrol dog; doesn't track people, nothing like that. He's just here to find narcotics and, essentially, (he is) one of the happiest dogs we have ever seen," Masters said.